Falcon 9 lifts off from SpaceX’s pad at Vandenberg, carrying Canada's CASSIOPE satellite to orbit. Launch took place on Sept. 29, 2013. WASHINGTON — Space Exploration Technologies Corp. (SpaceX) issued a statement Oct. 1 denying speculation that the upper stage of its Falcon 9 v1.1 rocket exploded on orbit following the rocket’s successful demonstration launch Sept. 29 from the Vandenberg Air Force Base in California. The speculation was spawned in part by the fact that the U.S. Space Surveillance Network is currently tracking more orbital objects associated with the launch than expected. A video taken in Mauritius shows a spooky looking glowing orb shining in the sky. It was actually created by fuel released by a SpaceX Falcon 9 rocket. The SES-8 satellite, owned by SES of Luxembourg, would be the first of these. It is tentatively scheduled to launch in October from the Cape Canaveral Air Force Station in Florida. However, that launch may be delayed as SpaceX investigates why a planned reignition of the second stage following deployment of the payloads could not be completed. "Regarding the rumors you may have heard about the Falcon 9 second stage, in short, our data confirms there was no rupture of any kind on the second stage," SpaceX spokeswoman Emily Shanklin wrote in an Oct. 1 email. "Following separation of the satellites to their correct orbit, the Falcon 9 second stage underwent a controlled venting of propellants ... and the stage was successfully safed. During this process, it is possible insulation came off the fuel dome on the second stage and is the source of what some observers incorrectly interpreted as a rupture in the second stage." SpaceX attempted to reignite the upper stage after payload separation in a demonstration of a capability it will need to place satellites into the proper geostationary transfer orbit. However, the reignition sequence was aborted after a problem was detected, SpaceX Chief Executive Elon Musk told reporters in a postlaunch teleconference. Following the launch, an eyewitness in Reunion Island off the eastern coast of Madagascar posted a photograph on the website Reddit of what amateur astronomers later determined was a cloud of rocket propellent surrounding the spent Falcon 9 1.1 upper stage. 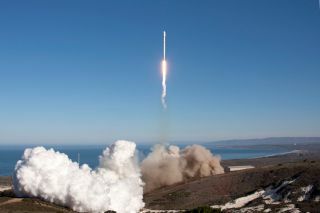 The upgraded Falcon 9 rocket lifted off from Vandenberg Air Force Base on a successful demonstration mission to deliver the CASSIOPE satellite to orbit. Launch took place on Sept. 29, 2013. By Sept. 30, the U.S Air Force-run Space Surveillance System was tracking 20 objects associated with the launch in low-Earth orbit. Experts were expecting to see 11 objects, including Cassiope; the three secondary payloads, one of which released seven independently flying objects; and the upper stage. "Following separation of the satellites to their correct orbit, the Falcon 9 second stage underwent a controlled venting of propellants (fuel and pressure were released from the tank) and the stage was successfully safed. During this process, it is possible insulation came off the fuel dome on the second stage and is the source of what some observers incorrectly interpreted as a rupture in the second stage. This material would be in several pieces and be reflective in the Space Track radar. It is also possible the debris came from the student satellite separation mechanisms onboard. "SpaceX will continue to review to help identify the source of the extra debris, but our data confirms there was no rupture of any kind on the second stage."